KawaiiPunk - Kawaii Mascot Blog: Centenary Celebrations! Wow, look at that huh? 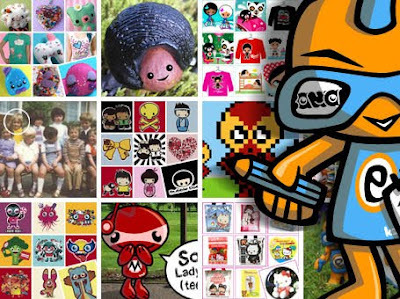 A picture of me with some of my favourite posts that have made this blog what it is today; the fantastic crafters, designers, and shops - Apple Noggin, Coolpuk, BubbleDoll, Fly Design, and Modes4U; and a selection of posts from ourselves and our readers - a pixelated Tiny Mascot, the Guy Behind KawaiiPunk as a kid, a mushroom with a slug on it, and that time we had to apologise to Lady Gaga. Ahhh… great days! Not So Perfect Christmas Gifts for Girls! Perfect Christmas Gifts for Girls! Jess White. Tip Top Tees! Wishing You a Blank Christmas!